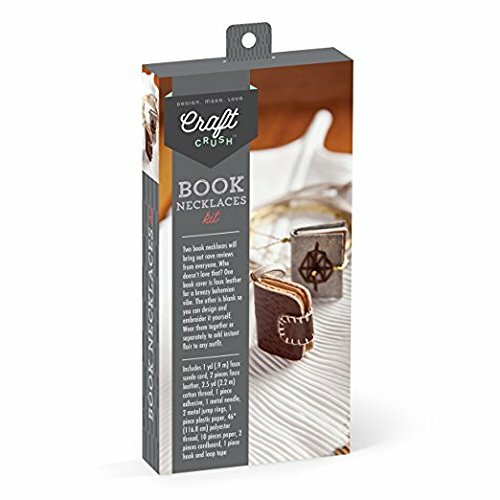 We read crafters very well, so we know you're going to love making these two clever book necklaces. They're fashionably fun and can be worn together or separately with necklaces you already have to add instant flair to any outfit. This is a new chapter in cool jewelry! What's Craft Crush? It's simply the latest, hippest and on-trend line of crafts from Ann Williams Group created especially for teenage and adult makers. From stylish home decor, to one-of-a-kind jewelry, to sophisticated accessories, makers everywhere already have a big crush on this line of crafts. They're also loving the fact that Craft Crush projects teach them techniques they may not have tried before, such as macramé, stenciling, decoupage and more. Craft Crush also puts a new, faster spin on weaving, thanks to our revolutionary weaving loom. In short, there's no shortage of cool crafts or methods. So keep on crafting'. It's modern. It's transformative. It's the one of the greatest ways to unleash your imagination and fire up your creativity. And all you need to create something truly great is a craft-and your own two hands. If you have any questions about this product by Craft Crush, contact us by completing and submitting the form below. If you are looking for a specif part number, please include it with your message.